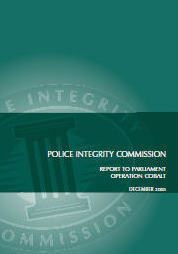 Corruption is endemic within Australia's police agencies, and certainly within the Australian Federal Police and New South Wales Police, which between them cover the Sydney airports. It also embraces crime commissions and other institutions charged with responsibility for police governance on behalf of the public. During the three years of research for The Expendable Project, the team uncovered a staggering amount of evidence to substantiate this statement. This included police involvement in most types of serious crime, and even in one instance, alleged blackmail of a government minister. We were approached periodically by individuals who clearly feared for their own welfare. To illustrate the significant scale of this problem, we have posted below a number of videos, which are freely available in the public domain. For further reading, we have also recommended some of the documents and reports which are posted in the Expendable Library. The following selection represents just a small sample of the videos, both amateur and professional, which are readily viewable on YouTube and other social video networks. They are in no particular order, but they do serve to exemplify how widely known the corruption actually is, particularly with respect to Sydney and its airports. This was particularly relevant to The Expendable Project, not only because the locale of the prime subject, Detective Sergeant Christopher John Laycock, included Sydney Airport, but because at least one of his close associates has been directly accused of owning the marijuana which was found in Schapelle Corby's boogie board bag. Laycock wasn't brought to trial until 2012. Despite the catalogue of serious crimes documented by The Cobalt Report, following production of what has been termed a "blackmail list", and subsequent closed-court sessions, he will serve as little as four and a half years in prison. For further information view The Laycock Blog. Standen was head of Operation Mocha, which was an investigation into the drug syndication ring which was active at Sydney Airport at the very same time as Schapelle Corby passed through. Indeed, the cocaine shipment was being managed by the syndicate in exactly the same baggage make up area as Schapelle Corby's boogie board bag. Standen was found guilty of conspiring to import $120 million of pre-cursor drugs in 2011. For further information, view The Standen Blog. Despite the impression created by the enquiries cited above, the issue of serious corruption within Australian police agencies, and the disturbing nature of the multiple bodies which purport to enforce integrity, has never been fundamentally addressed by any Australian government. Further, there appears to be no appetite whatsoever to address this. This is perhaps exemplified by the response to Dr Janet Wilson's letter of 3rd July 2011, which was sent to every Australian MP and Senator. Just two replies were forthcoming, confirming that the letter had been forwarded. The conclusion, that Australia is as indifferent to the chronic corruption within its police services, as it is to the abuse of the human rights of its citizens, is hard to avoid. Schapelle Corby is a direct victim of this malaise.